November 13th has come again,slipping its way into my heart and tears. It doesn't matter how calloused or indifferent I feel the day before, when Truman's birthday arrives, my heart opens and I allow myself to feel. Feel love. Feel sorrow and loss. Feel gratitude that I had the opportunity to see the physical bodies of two precious children I created before I got to hold sweet, alive, breathing Claira Jane. The tragedies make the miracles sweeter. Just now, as I tucked Claira under blankets for her nap and settled onto my own bed for scripture study, the baby boy who is due around Christmas startled my belly, reminding me that life is about to change. Again. I went into his almost prepared nursery and carefully retrieved his brother Truman's box from the top shelf. The box. It's this holding place for memories and dreams, both the broken and the realized. I'm extremely attached to the contents of this box, as well as protective of it. It's basically Truman's graveside, as we chose not to have him buried, but rather cremated by the hospital. 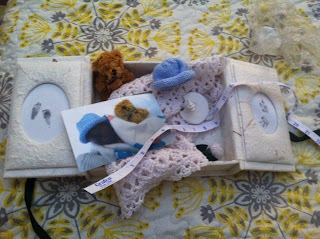 The contents include pictures of our sweet boy, the teddy bear, hat, and blanket his was given by an organization hoping to aid the grieving parents of miscarried and stillborn children, the tape measure the nurses used to decipher all 9 inches of his mortal frame, hand and foot prints, and plaster of paris castings of his hands and his feet. Our boy. Our hope after a previous early birth of a deceased baby and two years of infertility. Our hope in a box. Our dreams at an end and yet somehow a beginning, too. I will forever recall the hallowed space, the reverence of the staff, the cold feel of Truman's skin, his bruised, darkened, beautiful face. His fingernails and serene look, his eyebrows and delicate nose. The box captures all of this for me. I can open it up to feel it all anew, and I can close it to hold it for now. And then there are the quilts. Sterling's quilt hangs on our wall. I finished it within weeks of his birth. But Truman's quilt, I can't seem to finish it. A part of me isn't ready to. Another part of me is just a busy mom who deals with tantrums and diapers and a house that always needs a good cleaning. 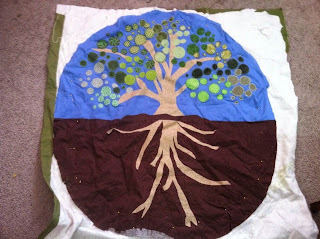 And another part knows that the tree represented in the quilt is still growing, still changing. I chose thirteen different green fabrics for the 135 leaves on the tree, 135 days Truman spent with us. The roots on the tree are deeper now than even than. Life is eternal. The separation of life and death, sky and ground, beg for explanation to the what-ifs, whys, and if-onlys. And yet there is contentment and peace, too, a circle of understanding that words and thoughts don't explain. My sweet children, I am ever learning what it means to be your eternal mother. You have changed me forever.